Whether you opt for sweet or spicy, finish your grilled goods with something strong. As grilling week on LAMAG.com comes to a close, allow us to finish strong with a few of our favorite sauces. Made in California, and in both sweet and spicy varieties, these are sure to kick up your ‘cue all summer long. 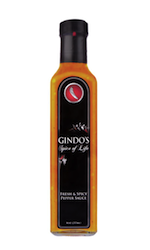 Most of Gindo’s sauces are pepper-based creations meant to increase the spice factor in any dish. 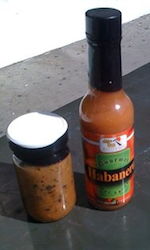 But the Honey Habanero version, with a brushable viscosity, goes further. 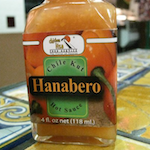 The sweetness of the honey tames the habanero, making it a great sauce for chicken, fish, or vegetables. We’ve even added it to a vinaigrette for a salad made with grilled summer squash. 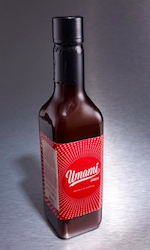 This sauce from the South East L.A. Yucatan-style restaurant does not mess around. 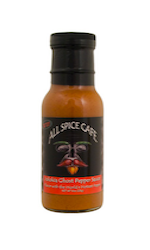 A vinegar base barely mellows out the heat of habaneros, which are roasted and blended into something resembling liquid fire. A little goes a long way here, unless pain is your pleasure. Think you can drink the stuff? Consider entering Chichén Itzá’s annual habanero eating contest. As sweet as it sounds, this jam from Silver Lake jamstress Jessica Koslow is not available year round, so unless you plan on doing your own canning this season, stock up. It’s sweet, but not cloying, and that’s why we think it’s perfect with everything grilled—from poultry to prime rib to peaches. Leftovers are versatile. 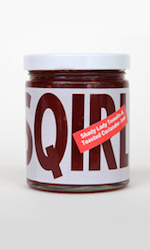 Try it on breakfast toast (sourdough) or a turkey sandwich (with swiss). Ghost peppers have been popping up around town in all kinds of things, from cocktails to desserts, but the sauce version from All Spice Cafe, (2008 Best of L.A.) which smokes the Indian pepper hybrid before blending it with vinegar, onions, garlic, salt, and sugar is on our summer shopping list. The sauce works especially well at bringing out the smokiness of pork and beef. Not to be confused with the sauces served at Umami Burger, this all-purpose steak-like sauce reminded us of A1, in a good way. For those who skew towards traditional brown sugar and vinegar flavored sauces, this blend from Omni Hotel Group (served and sold at their downtown location) will hit the spot. Not just for meat, the sauce also seems to go well with grilled potatoes.